This student hand-out was created specifically to accompany the PhET simulation "Alpha Decay". Appropriate for grades 8-12, it provides guided directions to help students understand the random nature of decay of a radioactive substance (Polonium-211). As they watch the alpha particle eject from the nucleus, they can see the "parent" decay into an atom with a mass number of 4 less than the original. Reset the nucleus to see the randomness. Next, the ante is upped, as students switch the view to "Multiple Atoms". They can empty a "Bucket" of 100 Polonium-211 atoms and watch a pattern of decay simulated among multiple particles. Even though the decay rate of an individual atom is not predictable, the simulation clearly depicts the trend that half the atoms will decay by the designated half-life. 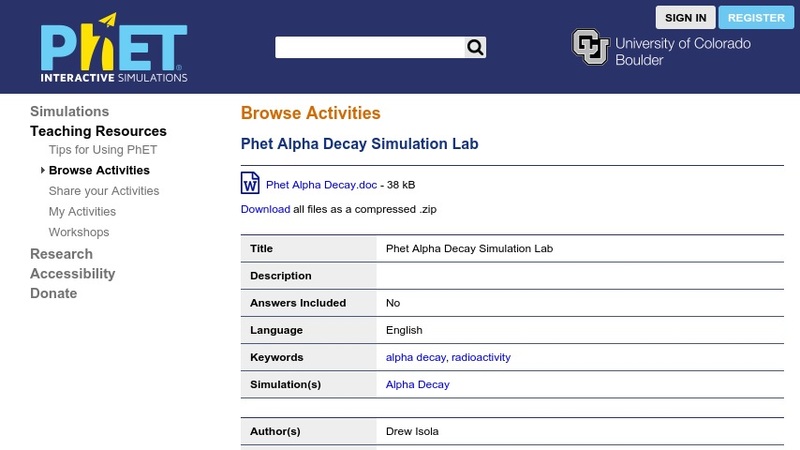 The alpha decay simulation, which must be open and displayed to perform this activity, is available from PhET at: Alpha Decay. This lesson is part of PhET (Physics Education Technology Project), a large collection of free interactive simulations for science education.